Indonesian soybean production can only meet about 30% of national demand. Efforts to increase soybean production include the use of improved seed quality and fertilizer application. 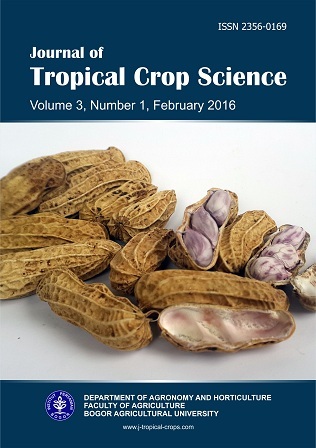 The aims of this research were to 1) examine the responses of six genotype soybeans to the application of different doses of NPK fertilizer; 2) determine the seed protein content of the six soybean genotypes following NPK application; 3) determine the interaction between soybean genotypes with NPK doses in affecting growth and yield. This research was conducted under a plastic house at the Faculty of Agriculture, University of Jenderal Soedirman, Central Java, Indonesia. The experiment was arranged in a randomized block design with three replications using six soybean varieties and four levels NPK fertilizer. Soybean varieties tested were “L/S: B6-G1” (V1), “L/S:B6-G3” (V2), “L/S:B6-G4” (V3), “Grobogan” (V4), “Burangrang” (V5), and “Argomulyo” (V6). Four levels NPK fertilizer tested were: without fertilizer (N0), 0.6 g per plant (N1) 1.2 g per plant (N2), and 18.g per plant (N3), or 0, 100, 200 and 300 kg.ha-1. “L/S: B6-G1” had the greatest number of seeds per plant (184) following treatment with 300 kg.ha-1 of NPK. The seed protein content increased with the increase doses of NPK. “Argomulyo” treated with NPK at 300 kg.ha-1 had the highest seed protein content (34.5%). Soybean responses to NPK treatment differed with varieties, particularly in the number of fl owers per plant, number of seeds per plant, grain weight per plant and seed protein levels. Adie, M. (2005). “Teknologi Produksi Benih Sumber Kacang-Kacangan”. Materi pelatihan pengelolaan benih. Balitkabi Malang. Hasil Panen Kedelai di Lahan SawahKering Pasang Surut”. Penebar Swadaya. Bogor. Arwin (2012). Galur Mutan Harapan Kedelai Super Genjah Q-298 dan 4-Psj. Jurnal Ilmiah Aplikasi Isotop dan Radiasi 8, 10-16. Central Bureau of Statistics. (2013). Soybean production, yield, and area harvested. www.bps.go.id/tnmn_pgn.php [October 10, 2013]. Central Bureau of Statistics. (2016). Soybean production, yield, and area harvested. www.bps.go.id/tnmn_pgn.php [March 10, 2016]. El-Shemy, H.A. (2011). “Soybean and Nutrition”. 486 pp. Intech Open. Croatia. Fabre, F. and Planchon, C. (2000). Nitrogen nutrition, yield and protein content in soybean. Plant Science 152, 51–58. Gardner, F.P., Pearce, R.B., and Mitchell, R.L. (1985). “Physiology of Crop Plants”. 478 pp. Ames: Iowa State University. Hardjowigeno, S. (1989). “Ilmu Tanah”. Mediyatama Sarana Perkasa, Jakarta. Krisnawati, A. and Adie, M.M. (2007). “Identifi kasi Galur Kedelai F5 Berbiji Besar dan Berumur Genjah”. Plant Breeding Conference Proceeding 2007. Balai Penelitian Tanaman Kacang-Kacangan dan Umbi-umbian. Lakitan. B. (2007). “Dasar-dasar Fisiologi Tumbuhan”. 244pp. King Grafi ndo Persada. Jakarta. Rismunandar. (1983). “Bertanam Kedelai”. 52 pp. Yasaguna. Jakarta. Somaatmadja. S.M., Ismunadji, Sumarno, M., Manurung, S., and Yuswadi. (1985). “Morfologi Tanaman Kedelai”. Agency for Agricultural Research and Development. Center for Food Crops Research and Development, Bogor. Sumarno and Adie, M.M. (2010). Strategi Pengembangan Produksi Menuju Swasembada Kedelai Berkelanjutan. Iptek Tanaman Pangan 5, 49-63. Sunarto, Fatichin, and Adie, M.M. (2008). “Interaction of Genotype and Environment, Stability and Drought Tolerance of F7 “Lokon” and “Sindoro” crosses”. Lokon/Sindoro as well as tolerance to drought”. KKP3T Report, Agricultural Research Centre. Jakarta.